Poverty looks like state violence, especially if you’re black, and working class. Once again this was highlighted on Monday when an off-duty Cincinnati Police Officer tased an 11-year-old girl at Queen City Kroger grocery store. The girl’s alleged crime – stealing food and then walking away from the officer! 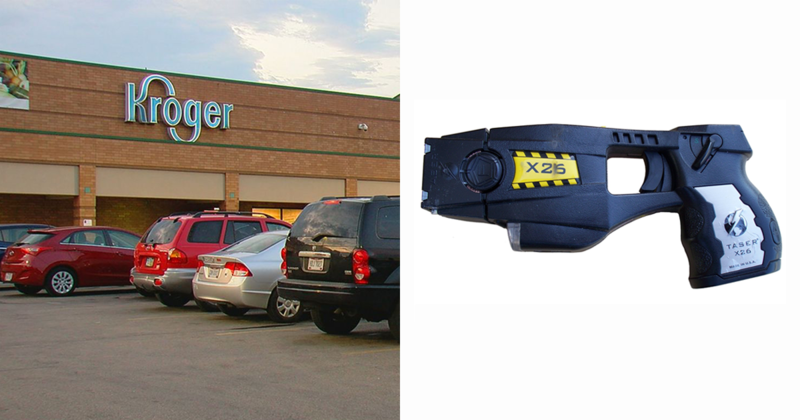 Initially, the Cincinnati Police Department (CPD) justified these actions by assuring the public that tasers are “safe” to use on anyone aged 7 to 70, dismissing what actually happened: a cop tased a child for allegedly stealing groceries. Anticipating public backlash, the police chief called the tasing “troubling,” and put the officer on “restrictive duty.” Essentially, instead of charging him with assaulting a minor, they transferred him. The girl’s mother, Donna Gowdy, correctly asked why an officer would ever feel the need to use a taser on a non-violent child in the first place. “If you can’t run, then you need to get off the police force. If you can’t handle an 11-year-old child, then you really need to get off the police force. You here to protect these kids,” she said. In addition to asking why the officer tased a child, we should ask why there are cops in grocery stores in some neighborhoods but not others. This violent action taken by the officer isn’t isolated. It exposes the depravity of policing and racial inequality on the one hand, and demonstrates how far the police will go to put profits over the needs of working people. The real crime the victim committed on Monday was being poor, black, and living in the wrong neighborhood. Kroger, which contracts with CPD for part of their security detail, can decimate the livability of a neighborhood on the basis of a line in a spreadsheet. Headquartered in Cincinnati, the corporation recently closed a store it deemed too unprofitable in a predominately Black working-class area of Walnut Hills, effectively turning the neighborhood into a food desert overnight. To keep our communities fed and safe, we need a food distribution system based on human needs – not profitability – that can provide healthy, high-quality food at affordable prices. The closure is part of the process of displacement of working-class communities, making it harder for long term residents to stay put. At the same time, the police and redevelopment groups work together to coordinate targeted patrols, sweeps, and other measures to heighten the surveillance and social control of the neighborhood – to ensure a secure business environment in order to maximize profits. This, along with rent increases and eviction notices, send a clear message working-class residents: time to move. Measures aimed at changing law enforcement policies, like Councilmember Chris Smitherman’s suggestion of raising the acceptable age to tase to 12, don’t reach the root of the problem. As long as cities prioritize the profits of big corporations over the needs of working-class communities, the police will continue to act as a corporate security force, and the city will continue to woo wealthy investors by “improving” historically working class neighborhoods, and incidents like what happened Monday will continue to happen. If the mayor agrees that it was wrong to use a taser on an 11-year-old girl, the city should move swiftly to fire the officer and charge him with excessive use of force. Release the tapes! Fire the officer and charge him with excessive use of force. Ban the police from using their tasers on children underin any circumstance. Give the Citizen’s Complaint Authority real teeth: full powers to launch a independent investigations, review department policies including setting enforcement priorities, budgets, and hiring policies. Tax the rich and corporations. Invest in working-class communities, including housing, schools, public transit, libraries, and eliminating food deserts. Follow Midwest cities like Minneapolis and pass a $15 an hour minimum wage. Instead of handouts to developers and corporations, invest in a jobs program. Next articleChina: Release Shen Mengyu and Arrested Jasic Technology Workers!